BMS (Battery Management System), as a key integral of battery electric vehicle and hybrid vehicle, is primarily composed of battery electronics (BE) and battery control unit (BCU), with the former responsible for collecting such data about battery as current, voltage and temperature and transmitting them to BCU, and the latter BCU accountable for information exchanges with other control units. BMS has three core functions consisting of cell monitoring, SOC (State of Charge) estimation, and single battery equalization. BMS monitors the working temperature and quantity of electricity of a single lithium battery cell and automatically adopts measures to equalize the charging and discharging current and prevent the overheating temperature, enabling EV power battery to gain best performance and the longest life cycle under any circumstances, and being a kind of crucial technology to develop electric vehicle. In 2016, a total of 748,000 electric passenger cars were sold worldwide, surging by 36.1% from a year earlier, with increments mainly from China and Europe. Foreign power battery BMS generally renders the active equalization technology and single car has higher costs. The global BMS market size reported USD4.17 billion in 2016, and is expected to reach USD11.17 billion in 2025, presenting a CAGR of 11.6% during 2017-2025. 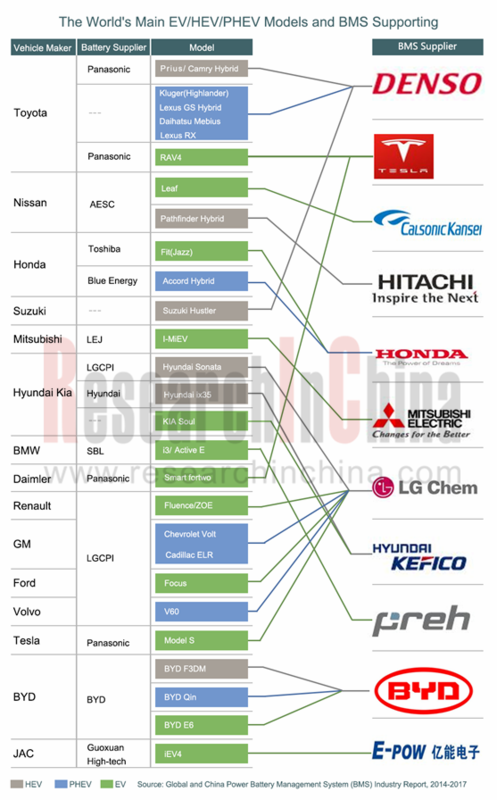 The traditional auto parts vendors represented by Denso and Preh have seize the initiative by dint of their key roles in vehicle supply chain. Denso as the most important supplier of parts for Toyota has provided BMS modules to vehicle models like Prius and Camry Hybrid successively, while Preh not only supplies products to BMW I series BEVs but vigorously explore Chinese market by resorting to the resources of its parent company Joyson Electronics. Cell vendors like LGC attempts to constricts the functional range of BMS and make it simple and universal, and to spin off software and data services as a separate supply to automakers. Among carmakers, Tesla BMS is mature and sophisticated and its next-generation technology will be applicable to bigger single cell. In 2016, China produced 517,000 electric vehicles and sold 507,000 ones, a respective upsurge of 51.7% and 53% year on year, helping Chinese market size of power battery BMS grow explosively to about RMB5 billion in 2016 and as expected to RMB14 billion to RMB15 billion in 2020. 4) Vehicle makers and battery cell vendors have their plans to extend into BMS industry chain. Due to technical barriers and constraint of R&D investments, it is hard for upstream and downstream enterprises to carry extension ambition. So, it is a rational act to outsource BMS solutions. 3) Vehicle makers. BYD and BAIC BJEV have made perfect deployments. BYD integrates battery, BMS and development of electric vehicle and enjoys advantages in cost and efficiency; BAIC BJEV is capable of developing BMS after acquisition of Atieva and need BMS suppliers no more. This kind of vendors share 21% of the overall market. 6.5 Harbin Guantuo Power Equipment Co., Ltd.
6.6 Anhui LIGOO New Energy Technology Co., Ltd.
6.7 Ningbo Bate Technology Co., Ltd.
6.8 Ningbo Longway Electrical Co., Ltd.
6.9 Shenzhen Antega Technology Co., Ltd.
6.10 Wuhu Tianyuan Automobile Electric Co., Ltd.
6.11 Shenzhen Battsister Tech. Co., Ltd.
7.3 Hangzhou Genwell-Power Co., Ltd.
8.1 Beijing Pride New Energy Battery Technology Co., Ltd.
8.3 Hefei Guoxuan High-tech Power Energy Co., Ltd.
8.4 China Aviation Lithium Battery Co., Ltd.
8.5 Sunwoda Electronic Co., Ltd.